Pula airport is situated less then 10 km from the city centre in Pula, the airport is very small and not particularly modern, but as a holiday hub it works fine. Inside the airport there is a kiosk, several ATM machines, a coffee bar and several car rental companies. During winter, Croatia Airlines is the only company flying to the airport. During summer season there are numerous companies and some of them are: Austrian Airlines, Ukraine International Airlines, Belarusian National Airlines Belavia, Rossiya, KrasAir, KMV, Europe Airpost, Europe Airpost, Jat Airways, Flyglobespan, Polet, Siberia, Transavia airlines, Germanwings, Ural Airlines, FlyNordic, Malmo Aviation, AeroSvit, Ryanair, Air Mediterranee and many more. Distance from Pula airport to the center of Pula is 8 km and it takes 12 minutes to get there. If you take a taxi you will pay 20 kuna for the start and 10 kuna for every next kilometer. If there are 1-6 persons, the price for one kilometer is 12.50 kuna; for 7-8 persons, 15 kuna. Waiting costs 100 kuna/an hour. So if you go from the airport to Pula you will pay around 100 kuna for 1 to 6 persons. There is no public bus to the airport. There are several companies offering airport transfer which has to be pre-booked. The transport is done by different vehicles depending on the number of persons. 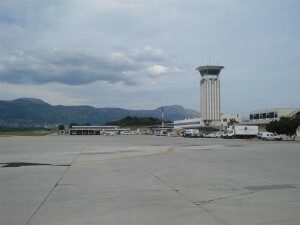 you can see transfer offers from to Pula airport to lots of destinations in Istria and Croatia here. if you have larger groups you also have option to rent a regular bus, avalibility depends on the destination you are going to. Transport for 1-3 persons from Pula airport to the city centre is 37 Euros, for 4-8 persons the price is 42 Euros. There are two sections at the parking place: section A and B. Section A is for cars and section B is for cars and buses. Parking is currently free of charge, this might although change for the summer season. Click on the map to find information about “how to travel from Pula airport” to varius destinations.